Mega church heretic Andy Stanley continues to cross the line into full blown humanism and abandon all sense of orthodox Christianity in pursuit of his carnal purpose driven dreams. We documented this week a conversation Stanley had a few years ago where he expressed that the bible was just a "collection of ancient documents" as he presented his strained beliefs that Christianity does not need the Bible. Instead, Stanley offered some vague notion of believing in what Jesus said in the Gospel accounts without making the obvious logical connection that the Gospel accounts are part of the Bible. To on the one hand discount the Bible as being inerrant and then in the next breath offer up something from the Bible as your new rationale for being Christian is asinine at best and completely heretical at heart. This is also because Jesus Himself is the Word of God. You cannot remove Him from the Word or the Word from Him unless you are trying to be disobedient to one or the other. If any verse is untrue then God is a liar. He breathed out the Bible. They are His words. What Stanley is trying to is undermine the authority of Scripture by co-opting the arguments the sinful world tries to use when it undermines the Bible. So some archeology professor thinks that there is no proof that the walls of Jericho never came down? Some history professor claims that there is no proof that the Israelites made the trek from Egypt to Canaan? Keep in mind beloved that in both of these scenarios offered the academics in question are not saying the events did not occur because they cannot say that. They were not there. All they can say is they have not found proof of it, thousands of years later. How many things occurred 4000 years ago that archeologists have no proof of? What is truly sad is that we know these things happened and we have proof -- the Bible. Now I understand why the world wants to dismiss the Bible but a pastor of a mega church? Why is he so quick to believe the unsaved college academics as opposed to God Himself? The earth is 4.5 billion years old? Says who? Scientists who must admit at the end of the day that they are guessing? How do we know they are guessing? Because they were not there! Even something as scientific as carbon dating is based on theory. Man has been trying to deny the existence of God since man was created but the church should not be in the business of helping discredit God. Today's science is tomorrow's old wives tales. Scientists will admit their positions are ever evolving and changing based upon new theories. How old will it be guessed to be tomorrow? Who knows? But it will still be man guessing as hard as he can to distance himself from the God he will answer to one day. So yes Andy, if the entire Bible is not true then Christianity comes tumbling down -- and it should. Who wants to believe in a God who gets it right sometimes? Who wants to place their faith in a God who lies or is found to be mistaken? Talk about the height of arrogance. That man would tell God He is wrong using manmade formulae and estimates and then find support in the arms of the church. Disgusting. This is where we start to see the damage done to Stanley's theology by following Rick Warren and the purpose driven heresy. Christians do not feel compelled to defend the Bible. Nor should we. God has not called us to defend the Bible. Yes there are apologetics experts who can and should continue to explain what the world thinks is unexplainable but let's peel back the layers of what is really going on with this logic. 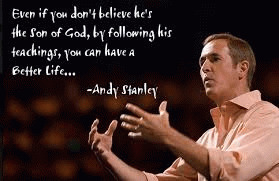 Andy Stanley is trying to convince people to become Christian. This is the purpose driven mindset. To sway people's opinions to "try Jesus" out. To make an intellectual appeal for a spiritual outcome. Maybe you left because you found out the Bible was fallible? Are you serious? Beloved, if someone "left" because they decided the Bible was fallible then they were never saved to begin with and there is the 800 pound gorilla in the room that Andy Stanley cannot see. When you run the purpose driven church model you are not converting anyone. You are not saving anyone. You are convincing them to raise their hands, repeat after you, get dunked, do a SHAPE application, tithe and get plugged into ministry. There are a lot of temporal changes and maybe even the temporal carnal preaching helps them in their temporal existence. But you changed nothing eternally. They still will stand before Jesus Christ on the last day and say "Lord Lord" and He will still respond that He never knew them. Let's deal with these separately. How does Andy Stanley know that the early writers and scribes prepared copies because they believed they were true as opposed to inspired? That's right; he doesn't. He is simply making this up to fit his pre-determined narrative. What about the above referenced instructions to Timothy? By the time they were copying these there is just as much a possibility that they did believe in the inspiration of Scripture. The second and third statements are so duplicitous. Yes it is true that the first actual Bible as we know it did not come about until the fourth century and that Christianity was the religion of Rome before a Bible was constructed. But that does not mean that the early church did not rely upon the Scriptures. Remember that early on the Jewish converts did not give up on the Old Testament documents. Jesus was Jewish! He constantly referenced the Old Covenant and Scriptures. How early on was the new church relying upon Scripture? Just look at the key verses! These are the closing remarks of Peter's second letter and he is assuring believers about the second coming of Christ. He refers to the letters Paul has written; letters we know would eventually form three quarters of the New Testament. But look how Peter refers to them! He refers to them as Scriptures! Along with "other Scriptures." It is generally accepted that Peter wrote this around 65 AD. So the notion Stanley proffers that the church got along without the Holy Word for hundreds of years is patently false and ignorant.